Why would you want to do the NLP practitioner training? Are you a business owner who wants to improve your communication skills? A manager who wants to understand how to get the best out of your team? Want to be a more engaging manager or boss and learn how to communicate with different personality types? A sales person who wants to learn ethical and powerful techniques to connect with your clients? A parent who wants to empower their children? A teacher, psychologist, doctor, coach or anybody who wants to looking for real deep lasting change? Want to learn how to win friends and influence people by understanding what people are really saying? Want to learn how to create success in all areas of your life? Looking for the best NLP training? During this 7 day NLP practitioner training, you will learn all of these things and so much more. These skills are invaluable both in business, education and all areas of our personal lives. These skills are widely applied in therapy, sales, training, management development and coaching. We have students from all walks of life and professions taking the NLP course, including military, doctors, business people, existing coaches, psychologists, mentors, house wives and people looking for a career change. How long are the NLP courses? The NLP training is offered at both the 7 day practitioner level, as well as a 14 day master practitioner level. (With pre-course study.) It is a interactive, informal and supportive training environment where you are encouraged to learn and enhance your new skills. The master practitioner training takes the skills that you learn during your practitioner course to a much deeper level. There are also a number of additional techniques and resources that you will learn at the master practitioner training. What to expect at the NLP practitioner training. The NLP practitioner training has been designed to provide you with a structured and comprehensive learning platform and has 3 components. Pre-course Study (Including course manual, MP’3s and course book). Assessment during the course and an open book test that is due on the last day. During the live NLP courses we cover some of the theory that you will have learned from the pre-study. You will then also see live demonstrations of the techniques, before doing practical exercises. This helps you to develop and hone your skills. You will leave the NLP practitioner training feeling confident in your ability to use all the techniques to help yourself and others. The course is designed to develop both your personal and professional life. NLP training is recognized for its many change techniques and often features in many other types of leadership, coaching and communications training. To ensure you receive quality NLP training you will experience the following. Individual coaching and support. Even after the live training. What certification will you receive on completion of the NLP practitioner course? 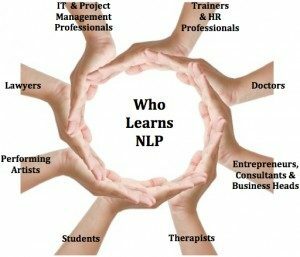 What does the NLP course cover? Understand and utilize body language in communication. How to set effective value-driven goals personally and professionally. How to take charge of your own life, having physical and mental alignment to become confident in everything you do. To adapt to different thinking and learning styles, and experience different perspectives. Learn how to manage stress, sustain high performance states and a greater sense of well being. Empowering beliefs that will alter your life. Goal setting that leads to results and achievement. How to build rapport, which the foundation of influence. Learn how to use your voice to gain rapport, even on the phone. How to disagree and yet keep rapport. Representational systems. Increasing your communication. Use language to transform your ability to communicate with others. Sub-Modalities and how we encode things unconsciously. Getting your brain to really work for you. How to change unwanted beliefs, habits and feelings. Learn how to permanently remove phobias. Language patterns and the use of words. Learn how to use presuppositions to impact appropriately on someone’s experience. Learn how to listen to everyday language to hear how others limit themselves. Learn how to ask questions that can lessen or even solve problems. Anchoring and having the power to feel how you want. How to control your feelings at any time. Perceptual positions and how view situations differently to achieve better results. Learn how to resolve interpersonal and inter-group conflict. Discover how to gain invaluable insights about other points of view, to aid decision making and leadership. Strategies and how we do what we do. Learn how to mold your sales approach to suit your client’s buying strategy. Learn how to spot weaknesses in other peoples’ strategies and improve them. Align identity, values, beliefs, capabilities, behaviors and environment to produce a compelling recipe for success. Parts integration and how to resolve inner conflict. Increase personal congruence and enhance energy levels. Improve how you can relate to time. Gain new strategies for using time. Discover the root cause of problems. Delete dis-empowering beliefs like “I’m not good enough to do…”, “I can’t have lots of money and a great relationship” or any other beliefs that hold you back. By mastering these NLP techniques, you will accelerate your ability to succeed in your life goals and achieve optimum results. Your effectiveness in working with others will dramatically increase. As will your ability to help those around you to achieve their greatest potential. You will master rapport so that you can effectively communicate with anyone. Your language will become more precise and elegant. You will be able to remove negative emotions and limiting beliefs so that you can achieve your greatest potential. You will be in control of your thoughts, feelings, behaviors and be able to create empowering emotional states whenever you want them. Please select the country in which you would prefer to attend the training. There are only 12 people per group, so you are assured of the best personal attention.